Textile Car Wash Systems (Textile Car-Wash-Systeme GmbH) was set up in 1996 by fibre and chemicals specialist Dr Hermann Josef Brielmaier and his son Rainer Brielmaier. TCW specialises in textile fittings for the washing and drying area of car wash systems. TCW recognised the trend towards textile car washes at an early stage. The company began with three relatively small portal systems, in which the textile Microvel® was tested for several years before it came to market. What was produced as a result was a high quality textile composite that differs in the structure of its fibre layers significantly from other textiles available on the market for car wash systems. By virtue of the two senior executives’ extensive know-how and dedication, TCW was able to firmly establish itself as a manufacturer of textile for car wash systems and is today one of the leading specialist companies in both the German and international markets. Microvel®, the textile composite used by TCW, was developed specifically for washing and drying in car wash systems. Microvel® guarantees a particularly thorough vehicle wash, while at the same time being gentle on the paintwork, and gleaming results from the drying process. Microvel® gets permanently tested and optimised in order to fulfil all demands made of a high quality textile car wash and drying system. TCW has already fitted out all types of standard washing system of various models and ages with Microvel® washing and drying textile. Thanks to specially developed standard systems plus solutions specifically tailored to the existing equipment, Microvel® can be used in almost all car wash systems. TCW has been heavily involved in formulating VDA (German Automotive Industry Association) car wash system compliance. It goes without saying that Microvel® is VDA compliant! Microvel® is produced and constantly further developed by a well-respected company based in Fulda. Alone due to the fact of our geographical proximity to the Microvel® manufacturer, we are able to test and implement new ideas quickly and thus to ensure continuous enhancement and optimisation of the textile. TCW developed and produces a unique pipe system for textile washing and drying rollers that greatly simplifies the handling and replacement of the textiles. 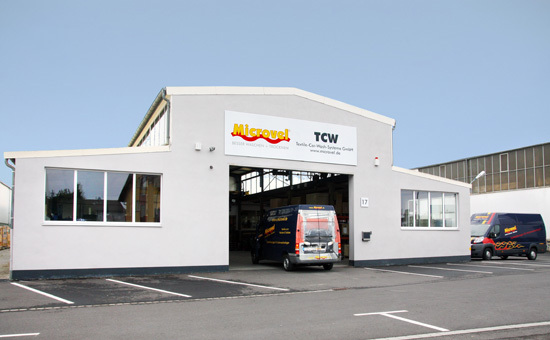 The fact that the pipe system is produced nearby and that the company maintains its own comprehensive stock of pipes and textiles enables TCW to react quickly to enquiries and customer requests. TCW’s complete range of services include the production of textiles to client specifications, the installation and commissioning of Microvel® in car wash systems and regular on-site customer support. Each customer’s requests can be specifically tailored to their own car wash system. TCW has also created a number of different solutions for special designs for applications in other sectors, such as the cleaning of solar and industrial systems. To look after its customers locally TCW has at its disposal a team of qualified field executives and service technicians. Working closely with partner companies that also specialise in car wash systems, we are able to implement complete concepts for the technical and visual upgrade of drive-through car washes. TCW’s customers of many years include a multitude of single and multiple car wash operators. By virtue of the company’s growing market presence, collaboration has been expanded with large car wash operator chains, carmakers and machine manufacturers at home and abroad.